Based on the assumptions described previously, here are the predictions for the AFC North division. The graphs represent season wins for each team. 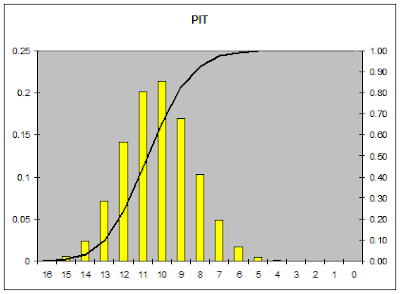 The solid bars represent the probability that the team will achieve exactly that number of wins in 2007. The curving black line represents the probability that win at least that many wins. Notice how that for each team the distribution of win probability is almost perfectly normal. The "at least" win distribution is sigmoidal, i.e. an S-curve. 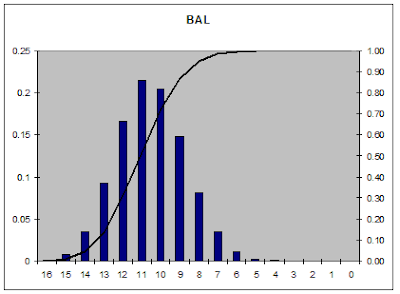 It is a CDF--a cumulative distribution function. 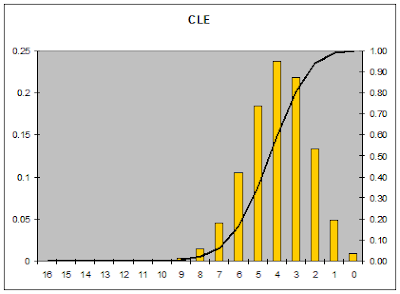 Note that the model does not predict CLE will have have 4 wins. It predicts that it's win-probability-distribution is centered at 4 wins. The Browns could have up to 9 wins, or could go 0-16. 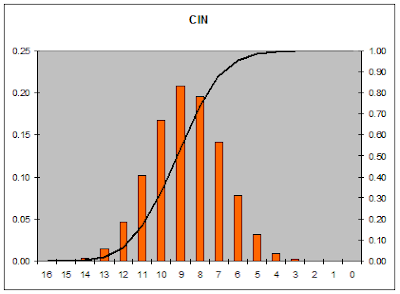 Although BAL has the best chance to win the division, PIT and CIN have solid chances as well. This does not take into account personnel changes--draft picks, free agent singings, or retirements (or suspensions in the Bengals case). It merely extrapolates last season's performance stats onto this year's schedule, then calculates the total probabilities of every possible outcome.